In its short 15-year history, University of South Florida football fans have experienced the highest highs and the lowest lows in games that are too frequently decided in the final 60 seconds. Exhilarating wins and anxiety-ridden losses test the nerves of USF fans week in and week out during football season. Quite fittingly, the best advice for getting through another frustrating year came right from the heart of campus in Tampa, Florida. Michele Dye, communications and marketing director at USF's College of Arts and Sciences, was watching the 2012 Olympics earlier this year and got inspired by the way London had captured the world's attention. She loved the "Keep Calm" posters and the various parodies she'd seen over the years, so using that tried-and-true concept, she designed an image that would resonate with USF students, faculty, staff and fans. Dye posted the image on the College's Facebook page, which quickly went viral among USF's online community, resulting in about 100 new page fans, more than 200 likes and close to 100 shares in a short period of time. So what is it about "Keep Calm and Go Bulls" that USF fans connect with? "After the Olympics, I think the slogan took on new meaning," said Dye. "At the beginning of the fall semester, the university announced a hiring/spending freeze. And then the football team has been having a rough year, so this slogan means many things to different people. The whole campaign was kind of spur-of-the-moment and turned into something bigger than I thought it would." 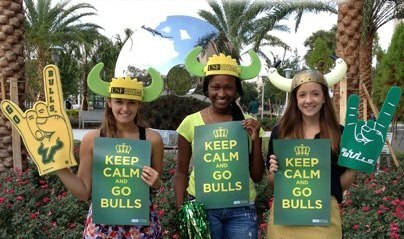 The excitement around "Keep Calm and Go Bulls" spawned limited edition posters and shirts, which are so popular that Dye and her team have been overwhelmed with requests. 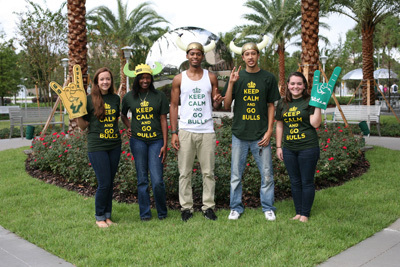 "Keep Calm and Go Bulls" shirts are on sale now and available in three different styles: ladies' white tanks, men's white tanks and unisex USF green T-shirts. To purchase one, click here to download and mail in an order form or stop by Cooper Hall 107 on campus. Payment must be made by check or money order to the "University of South Florida." What do you think of "Keep Calm and Go Bulls?"